ONLY $5.99 ! ! ! A finder scope is a secondary scope that's used to help you locate objects in the main telescope. Tube has a gloss black metallic finish and cross hair reticle. Works great to replace a lost or broken finder. Includes mounting bracket and dust caps. Comes packaged in plastic bag. 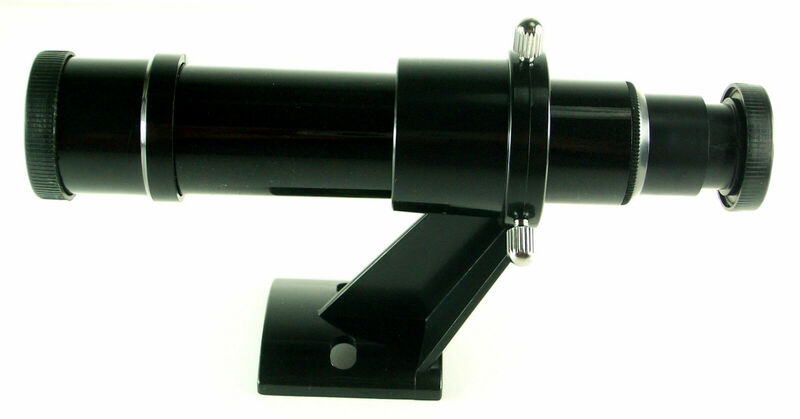 Mounting bracket has curved base with two holes and attaches to telescope tube with bolts or screws. Bracket will not slide into a dovetail base. Length of the red arrow is 7mm, blue arrow is 29mm, and distance between the two black lines is 22mm. NOTICE: We only ship to the address supplied by PayPal. If you want an order shipped to a different address, other than your primary PayPal address, you must add the additional address to your PayPal account BEFORE sending payment. It is simple and quick to add additional shipping addresses to your PayPal account. DO NOT ask us to ship to an address other than the address supplied by PayPal. Shipping & Handling in the U.S. is $3.99 by First Class Mail.